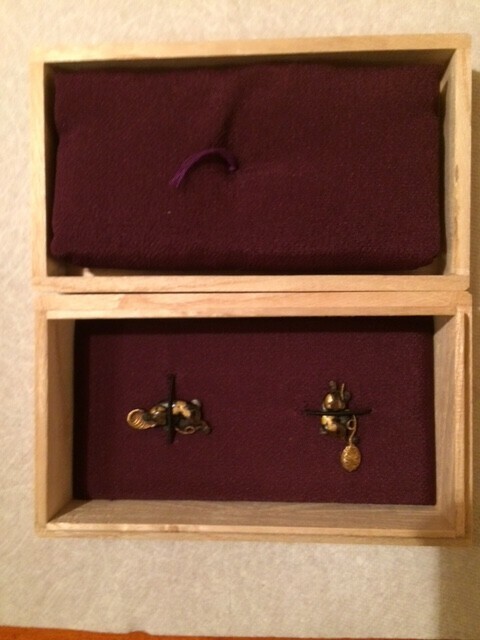 Yoshimichi Collectors. 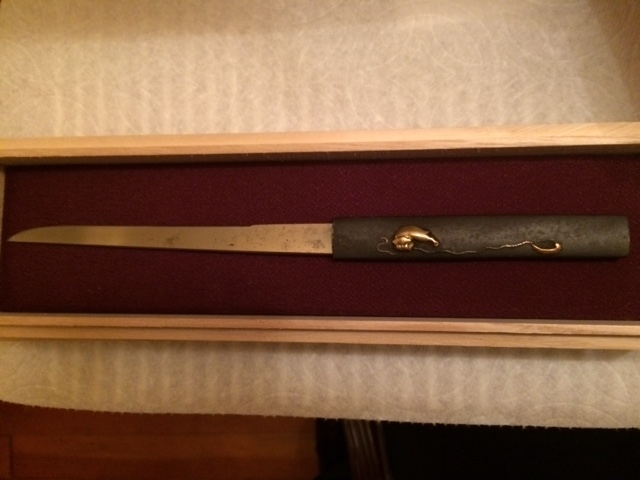 I am going to be listing a signed Tamba no kami Yoshimichi kogatana with what looks like sudare-ba and kikusui floating on water hamon for sale on Ebay, but I want to give NMB members first shot before doing so. 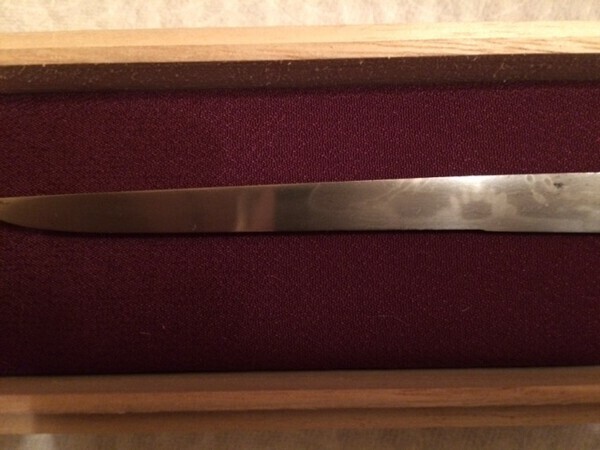 Most Yoshimichi blades we encounter seem to be wakizashis, so if you have one with koshirae and need a Yoshimichi kogatana to round it out, here you go. 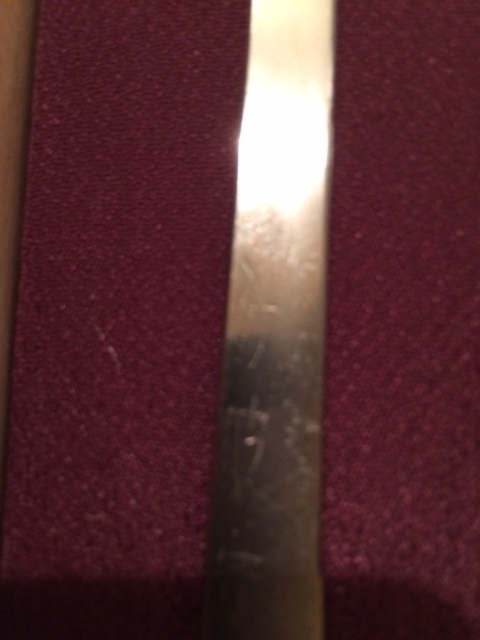 The mei is very light, but you can make out the kanji in the light. My pictures are pretty poor of the mei, but it is there. The kogatana is in decent polish with a floating kikusui in the hamon. 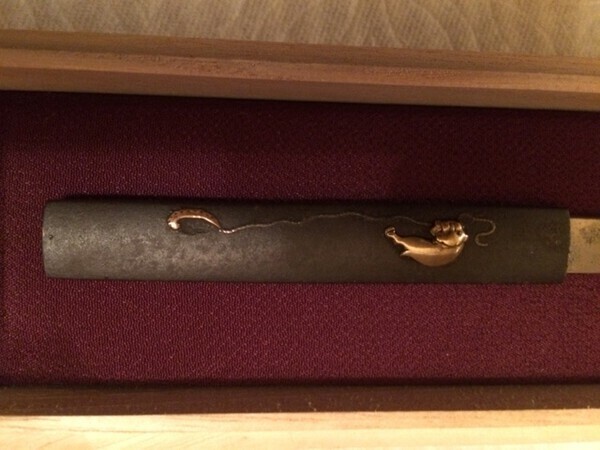 It comes with an iron kozuka with some surface rust wirh a gold metal cat playing with maybe a yarn motif. 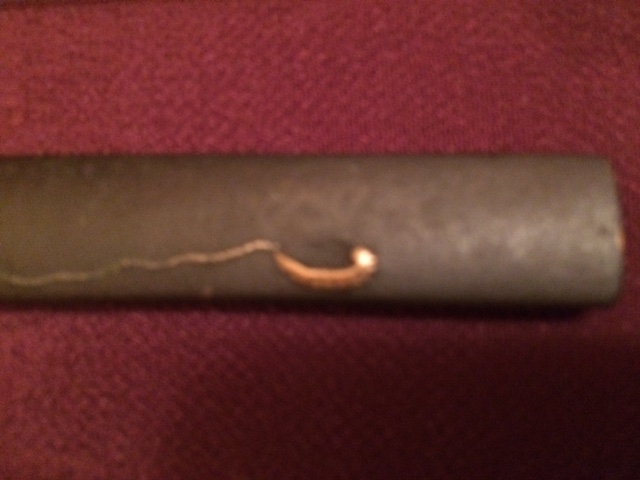 It looks like part of the metal on the yarn ball is missing. 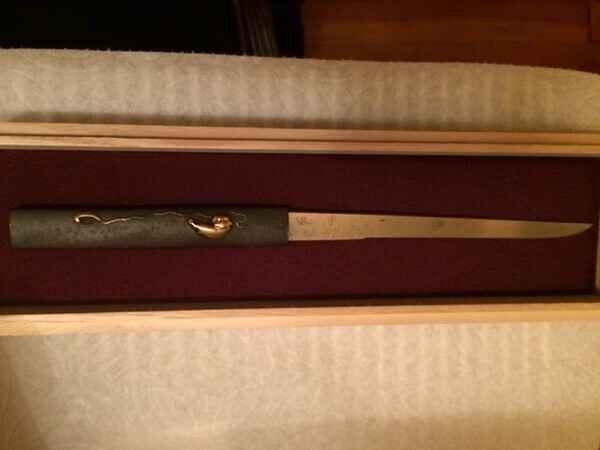 I will throw in the kozuka box with the deal. 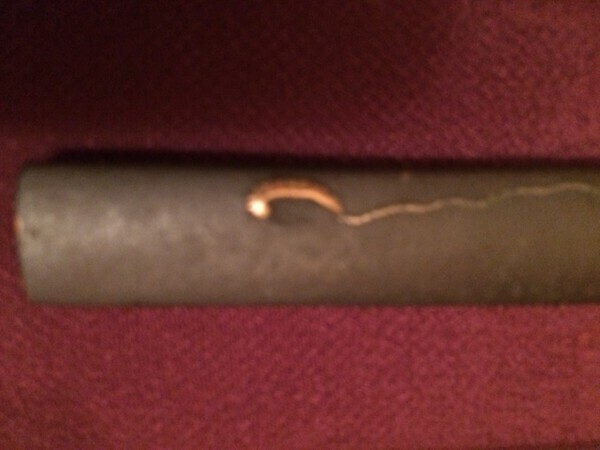 PRICE: $425.00 net to me, payable by Paypal ("friends"), plus buyer pays shipping and insurance costs. 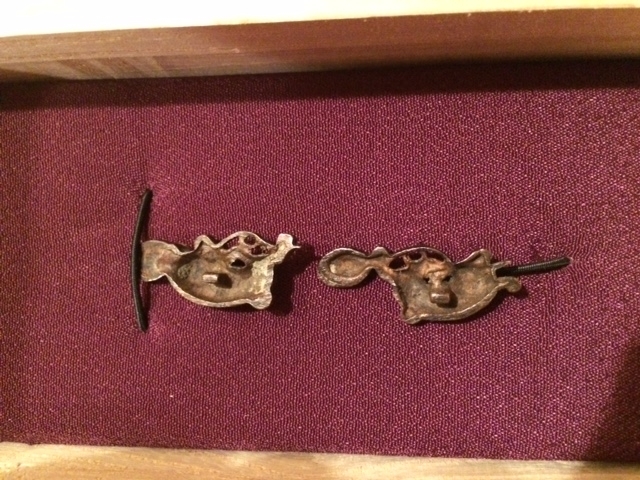 I also have a set of cat menuki with a similar motif with a padded box. 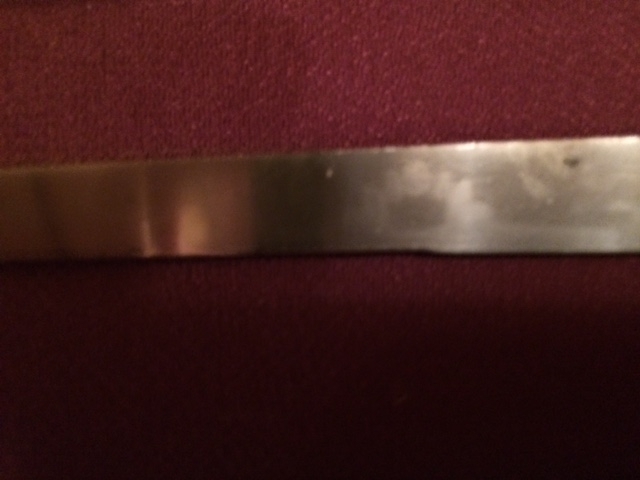 These are small and appear to be tanto size. 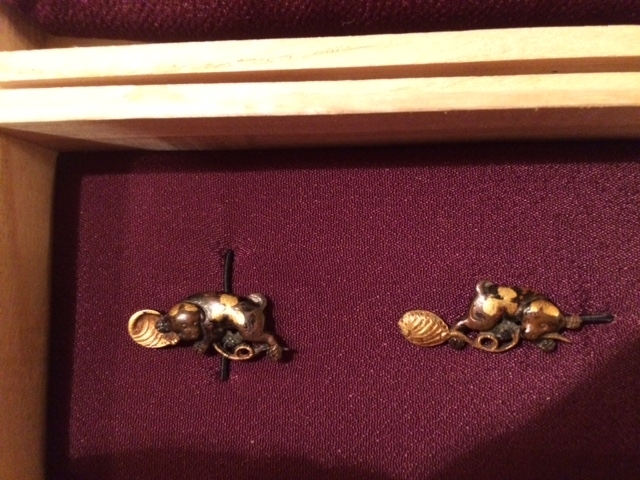 They look like shibuichi and gold.They are in useable condition and would look nice on a tanto. PRICE: $175.00 net to me, payable by Paypal ("friends"), plus buyer pays shipping and insurance costs. If someone wants both items, the package price is $575 net to me, payable by Paypal ("friends"), plus buyer pays shipping and insurance costs. If you have any questions, send me an email at besheehan@aol.com or through NMB. Thanks for looking. O.K., here's a better photo of the mei (and a tin of Kirkland shortbread cookies).. I put some uchiko on the mei to try to bring out a little better. By the way, the cookies are not for sale. 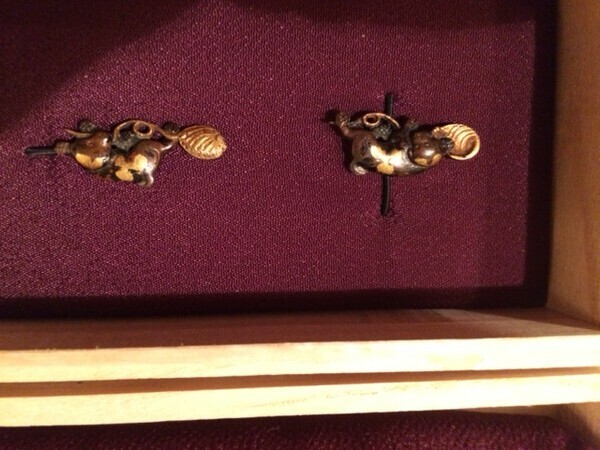 Motif is puppies with abalone. Thanks for the heads up. Wow. Am I glad I listed them here first before loading them up on Ebay or some other site. 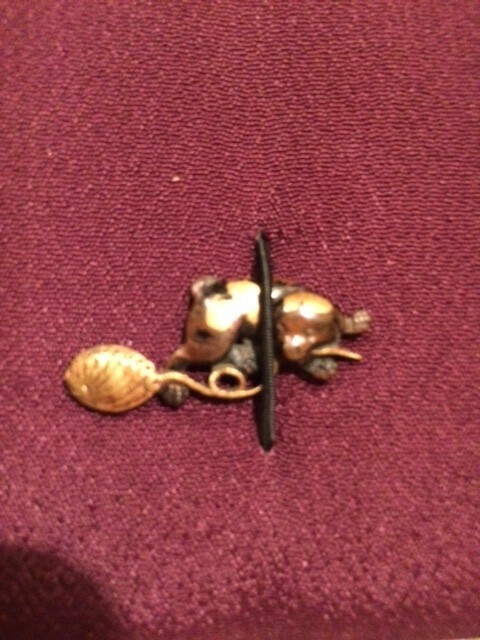 I have an iron tanto size tsuba with a somewhat similar style motif that I also thought was a cat motif as well. I better look at that one closer, and with some better glasses. Thanks again for clarifying the motif, Steven. So much for the cat chasing a ball of yarn idea. Bill E Sheehan (Yoshimichi) . You are welcome. 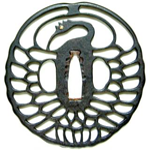 Its a charming motif, good luck with your sale. 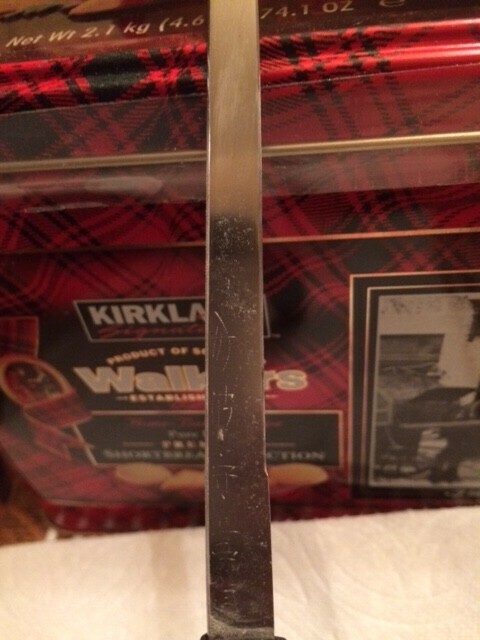 That is a really nice kogatana withan interesting hamon. 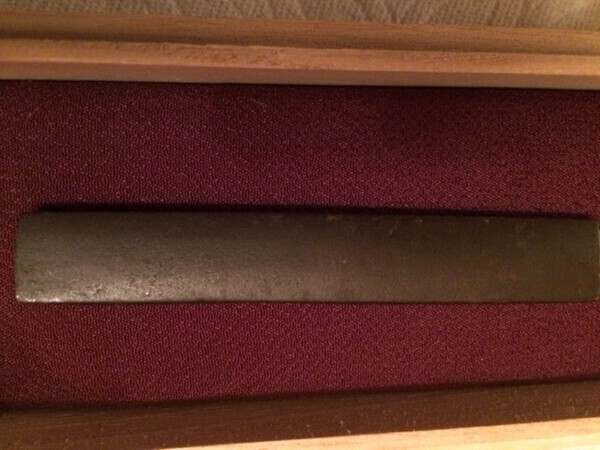 Not your average one, would love to see that go into shirasaya. Brian raises an rather interesting point. 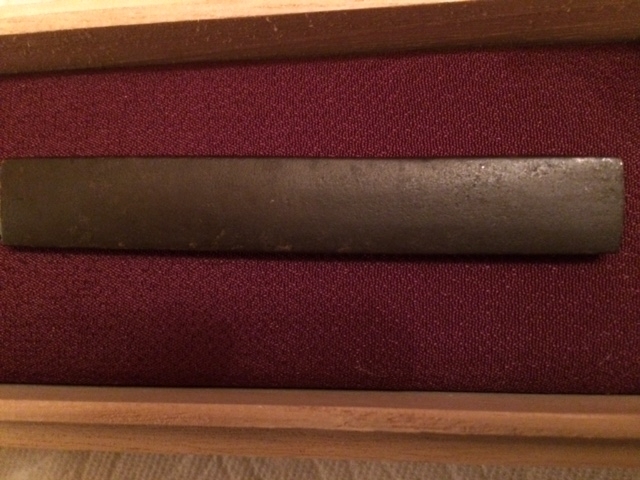 The hamon on this kogatana is not commonly encountered, and Yoshimichi kogatana are pretty desirable, This kogatana would look great in shirasaya, or in a better kozuka. 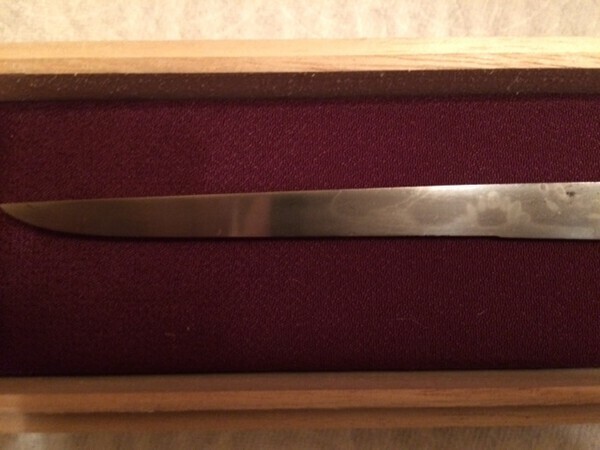 I am not opposed to selling the kogatana blade separately from the kozuka, if that works better for a member. 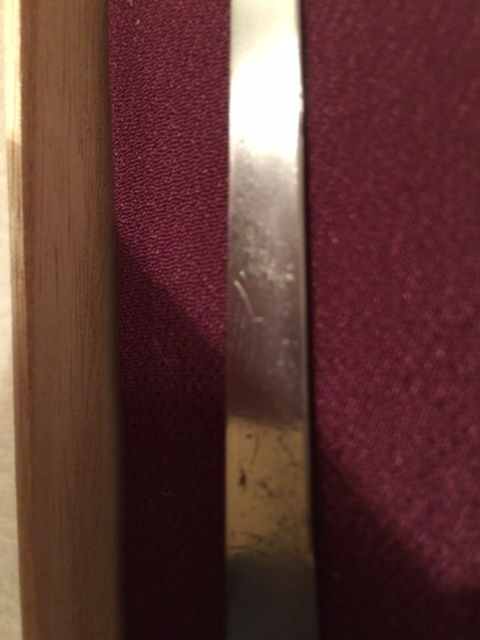 I am happy to keep the kozuka by itself, If a member wants just the kogatana. I will sell the kogatana alone to an NMB member for $300 net to me payable by Paypal ("friends or family"), plus the buyer pays shipping and insurance costs. If interested, let me know fairly quickly. Thanks again for looking. The kogatana blade is on hold pending payment. 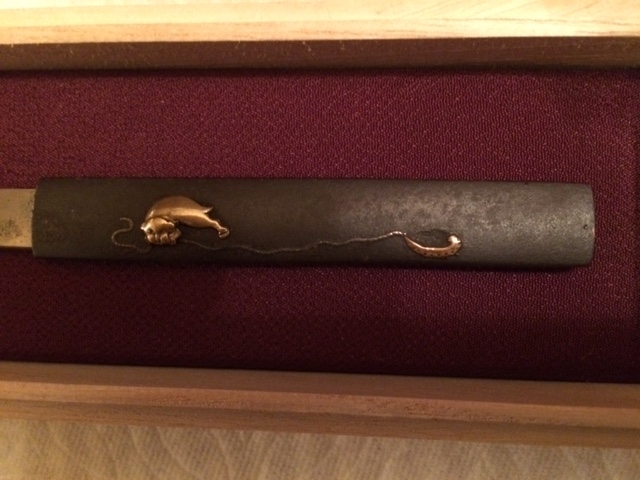 The kozuka and menuki are still available, if interested. . Thanks. 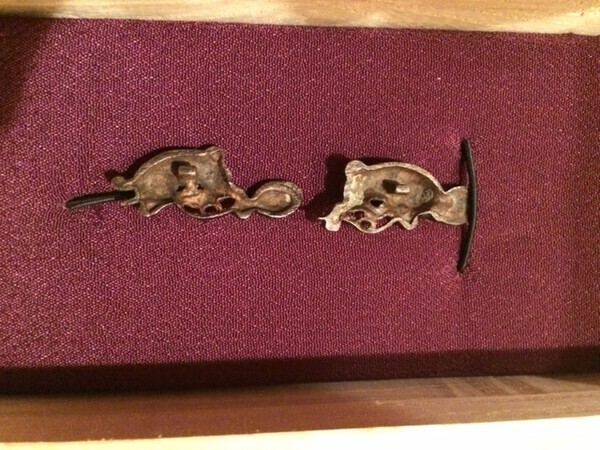 The kozuka and menuki are being listed for sale on Ebay. Thanks for looking and the comments. 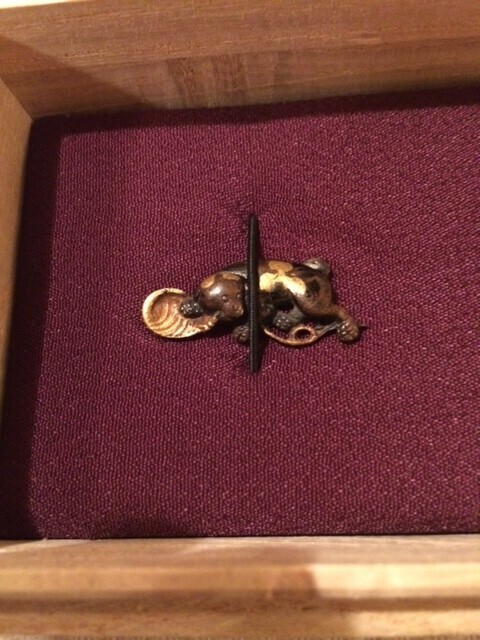 The Ebay auction number for the menuki is: 273064411668. Thanks.